Snack Girl feels for flight attendants or anyone who has a job that can be incredibly unpredictable. How do they do it? Love your emails, I look forward to checking your latest one to be amazed at. I'm a flight attendant on the go, so have to be careful not to graze on airline/airport food (yuck) !!!! Please keep us in mind for all the ungodly hours we work and sometimes have to rummage through our bags to see what we have to eat between layovers and running to catch the next flight. Yesterday was a mess because of the waiting of the flights due to storms in Northern California. How do you eat healthy when you have a job like this? Well, I have compiled ten suggestions for Agnes and anyone else that needs to toss some food in their bag to avoid junk food. 1. 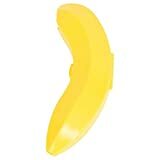 Put your banana in a banana keeper! This way you get your needed potassium and your banana remains unbruised. The banana will ripen nicely in this container. 2. Measure out some almonds, walnuts, or other favorite nuts into a small container. ¼ cup is about 160 calories of nuts. 4. 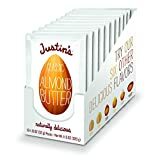 Justin’s Nut Butter Packs - These guys are super delicious and will keep you filled up until your next meal. Some people prefer nut butter to nuts (creamier) so these little packs are perfect. 5. Healthy Jerky - Not all jerky is made with meat and filled with MSG and salt. Jerky is high in protein, low calorie , stays fresh forever and is a super savory snack. Check out healthy salmon or turkey jerky. 6. Horizon’s Organic Chocolate Milk Box - These cute milks aren’t just for kids! Shove one of these shelf stable milks into your bag for a 150 CHOCOLATE fix. The flavored milk is a bit high in sugar so go with the unflavored kind for a 110 calorie snack. 7. Lara Bar - This is the bar for people who want NOTHING added to their bar. For example it has just almonds, dates, and bananas in its “banana bread” flavor. The downside is that it is 230 calories so try to eat just half (not easy). 8. Doctor Kracker - If you love a crunch for your snack - try Dr. Kracker. They use whole grains, seeds, and very little sugar to make a nutritious cracker. Warning: Dr. Krackers are a bit hard (but they are delicious). 9. Triscuits - Six Triscuits are about 120 calories. They are made with whole wheat, oil, and salt and are an easy cracker to find for a quick, healthy, and salty snack. 10. Dried fruit - Raisins, dried apricots, and dried apple slices are a great snack. Just make sure you choose ones without added sugar (like those dried cranberries) and you keep your portion size small. Please share your favorite "on the go" snacks. Yum! You picked some good things here! This is good to know because I'm traveling this summer and I didn't know what to bring. This is perfect. I am going to print this!! Thank you!!!!! Hard-boiled eggs are a great go-to, as well as pretzels and cheddar cheese sticks. PB&J's travel well, and are a great classic snack. Oh, and apples or oranges! I just picked up a box of Funky Monkey freeze-dried fruit (I got pineapple! ), and it's great for fixing crunchy cravings as well as sweet ones! They come in different size packages, so portion control's pretty easy. Another way to do it is to make some serious granola and portion it into baggies, and carry them with you. I am a granola fan in a ridiculous way. Why is the banana keeper higher in price while other products' prices are lower? 3. Baby packs of carrots or other hard vegetables= they do not get squishy and they are full of vitamins. Only 45 calories per 2 Tbpsns and almost all of the nutrition and protein of regular peanut butter but 1/4 of the calories! Delicious too - I have had both regular and chocolate. One jar goes a LONG way. You can order it from the mfg or local health stores carry it too. Several taste varieties, all are organic and whole grain - Deliciously good for you. This snack packs well in one of those little Glad containers and all you need is a smidge of water for the powdered peanut butter - not an issue since we all carry our water bottles, right? Very satisfying -- has the sweet taste, the savory taste and the smooth and the crunch texture -- all those things we crave in a snack. My favorite "on the go" snacks are boxes of raisins. One thing we do have to keep an eye on are things that we *think* are healthy choices but really aren't - and products advertised as healthy but aren't or are really just for one part of the population. Dried fruits, great snack ... but portion control is a must ... dried fruit is concentrated sugar - diabetics really have to watch those sugar spikes and everyone else really needs to watch how much sugar they are consuming (natural or processed) so they don't end up with diabetes also! Energy and protein bars also carry a lot of sugar ... really, they are good for athletes and body builders but how many of us are in that rank? CHECK THE LABELS ... Do you really need 25g of sugar? Even natural sugar? Or 33 carbs? If you are running a marathon, sure! But grabbing it as a snack because you are stuck at your desk or driving around doing errands - maybe not so much. At 33 carbs or close to ... you are getting close to *meal* counts, not snack counts.